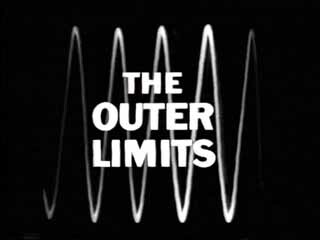 The Outer Limits TV show from my misspent youth. "There is nothing wrong with your television set. Do not attempt to adjust the picture. We are controlling transmission. If we wish to make it louder, we will bring up the volume. If we wish to make it softer, we will tune it to a whisper. We will control the horizontal. We will control the vertical. We can roll the image, make it flutter. We can change the focus to a soft blur or sharpen it to crystal clarity. For the next hour, sit quietly and we will control all that you see and hear. We repeat: there is nothing wrong with your television set. You are about to participate in a great adventure. You are about to experience the awe and mystery which reaches from the inner mind to... The Outer Limits." 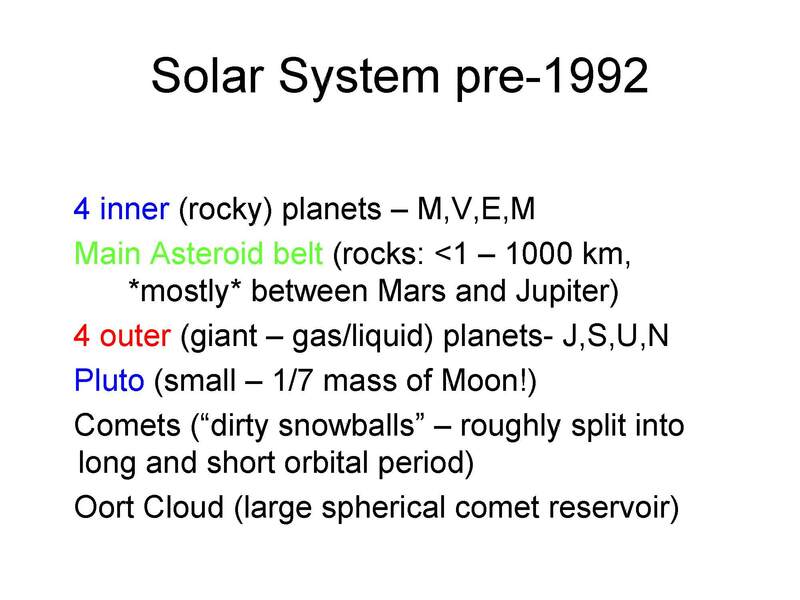 Solar System pre-1992 This is a summary of the Solar System before 1992. A slide summarizing the solar system made today would include a new major piece- the Kuiper Belt. Comet reservoirs Once a comet enters the inner solar system, it doesn't usually last very many orbits before it literally evaporates. Thus, comets cannot have always been in their present orbits. There must be some place where comets are "frozen". 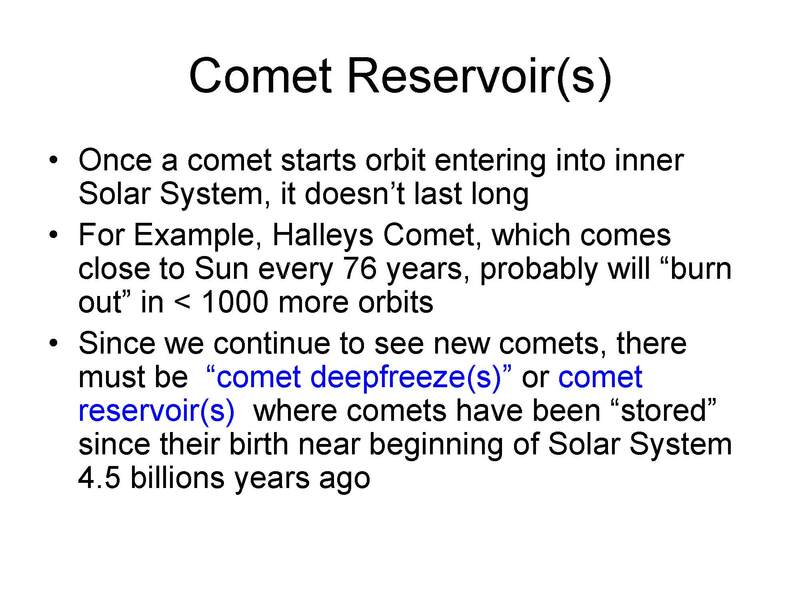 From these "reservoirs" comets are sometimes knocked into orbits that bring them into the inner solar system where we can see them after they are heated by the Sun and display a coma and tail. Oort Cloud In the 1950s, Dutch astronomer Oort proposed the existence of a vast more-or-less-spherical cloud of trillions of comets surrounding the solar system. This is called the Oort Cloud. 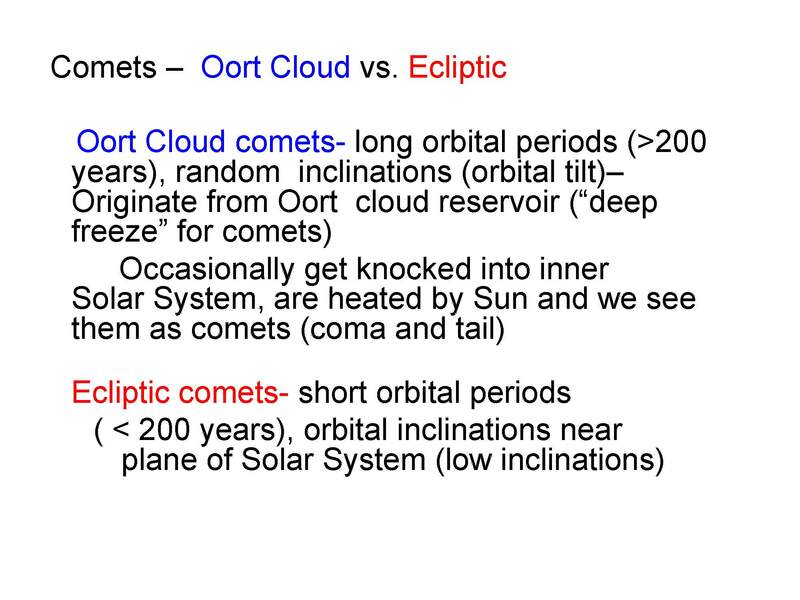 Two types of comets In the 1970s and 1980s, it was realized that there are 2 basic types of comets. The Oort Cloud comets, since they come from the spherical Oort Cloud, can come in at any angle and direction. A separate class of comets, called ecliptic or short period comets, tend to lie near the plane of the planets. 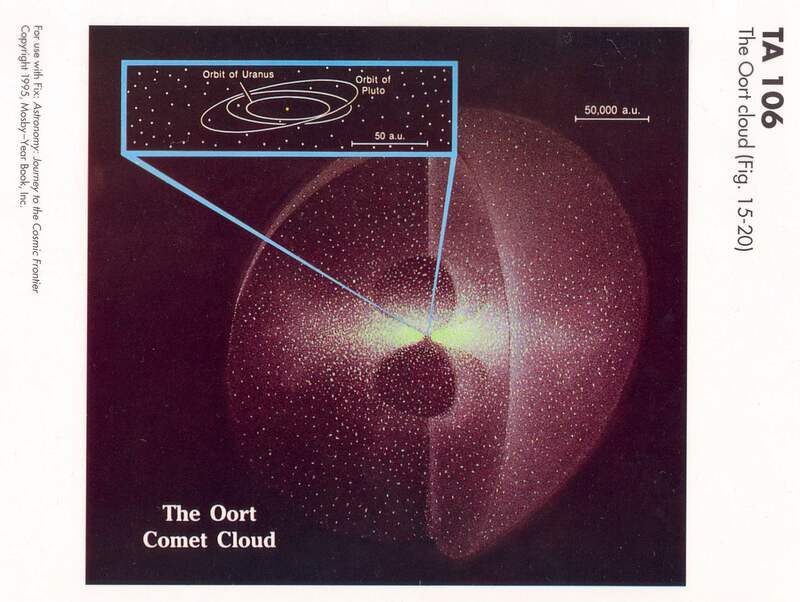 (The book uses "short period comet" instead of ecliptic comet- see p. 447) These comets cannot come from the Oort Cloud, so astronomers started looking for a second comet reservoir that was flat instead of spherical. 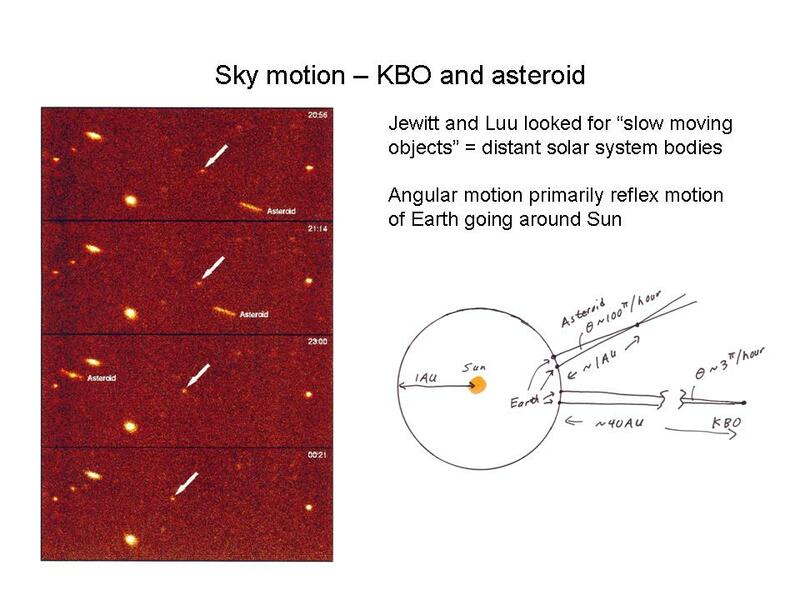 First KBO The first object in this second comet reservoir, which is now called the Kuiper Belt, was found in 1992. This object was out past Pluto and was a few hundred miles in size. It was found the same way that asteroids are found- a point of light that moved amongst the stars- but was moving very slowly so had to be far away compared to the asteroids. KBOs Astronomers have now found about 1200 KBOs (Kuiper Belt Objects) and we think there are many millions of such objects. 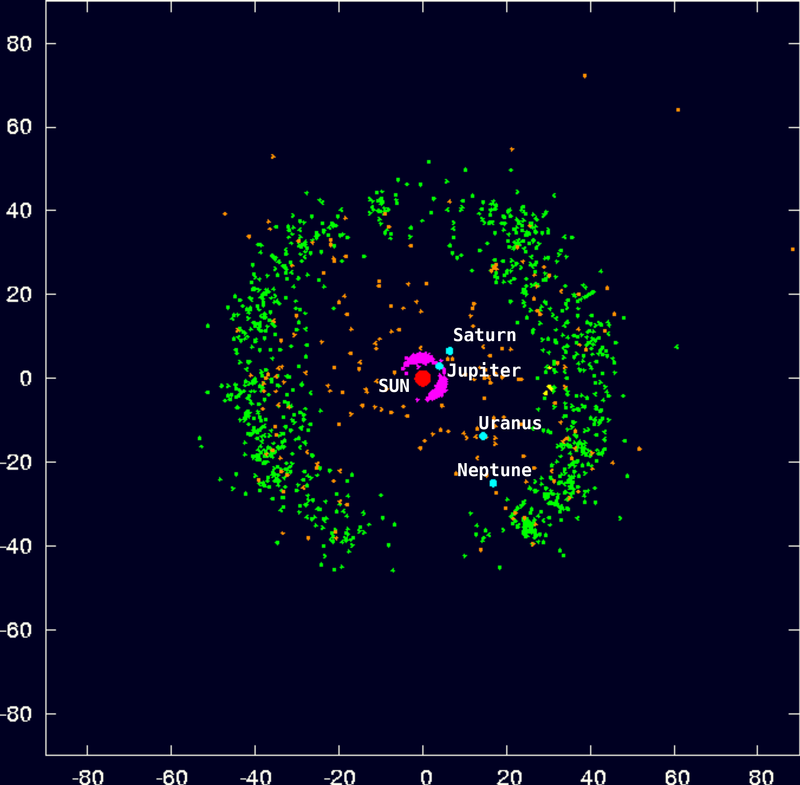 Some of the currently known KBOs are represented by green dots in this map of the solar system. There are probably more KBOs than there are asteroids, so the Kuiper Belt is a major new component of the solar system. 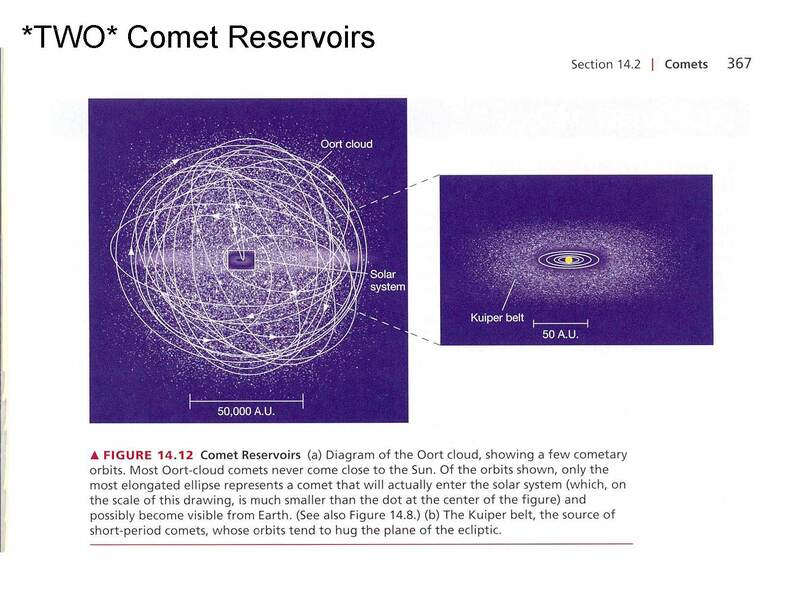 Two comet reservoirs Thus, we now think there are now two comet reservoirs- Oort Cloud and Kuiper Belt. The Oort Cloud is an enormous spherical region containing trillions of "dirty snowballs" that become visible comets if they are knocked into the inner solar system. The Kuiper Belt is a smaller (at least compared to the Oort Cloud!) donut-shaped region of "dirty snowballs" that lies near the orbit of Pluto. We think the short-period comets come from the Kuiper Belt. Pluto and What the heck is a planet, anyway? 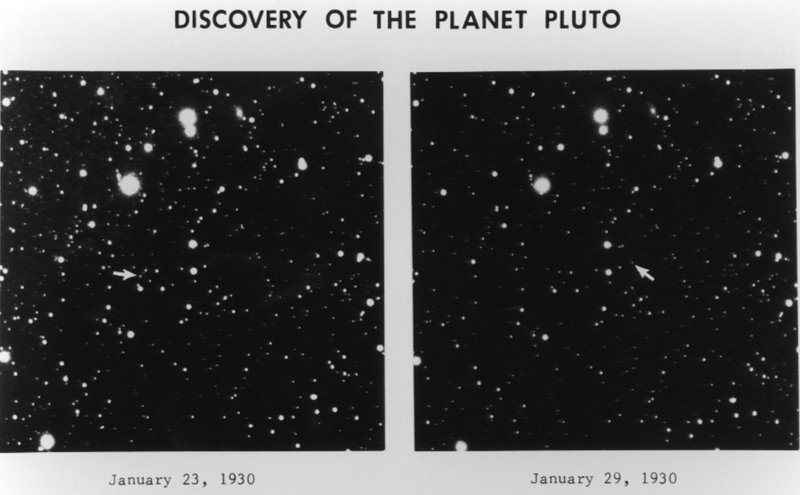 Pluto discovery Pluto was discovered in 1930 as a faint moving dot of light. When this slide was made Pluto was considered a planet, but the title words "Planet Pluto" are now not accurate. Pluto and Charon to scale with Earth Pluto is now known to have several moons, the largest of which is called Charon. 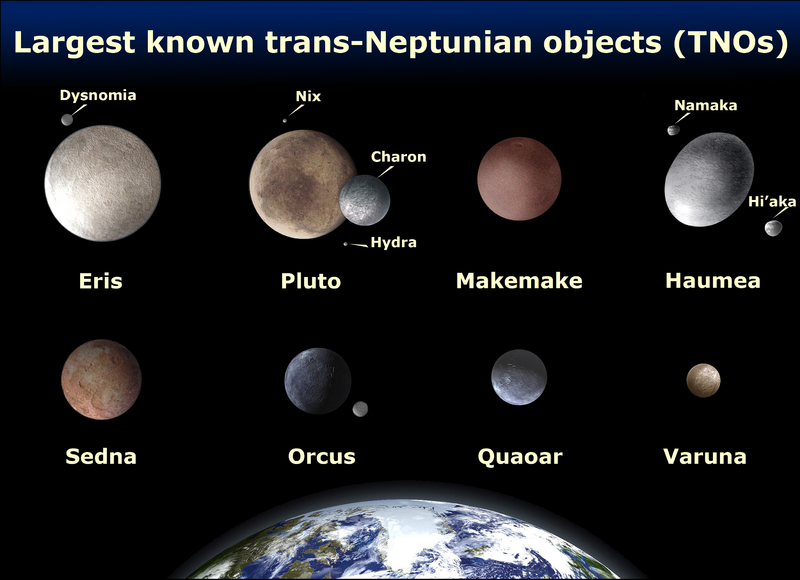 Largest KBOs (as of 2011) Amongst the newly discovered KBOs (TNO and KBO mean the same thing) is at least one object (Eris) larger than Pluto. The 8 planets Everyone learned in school that there are 9 planets, with Pluto the 9th. 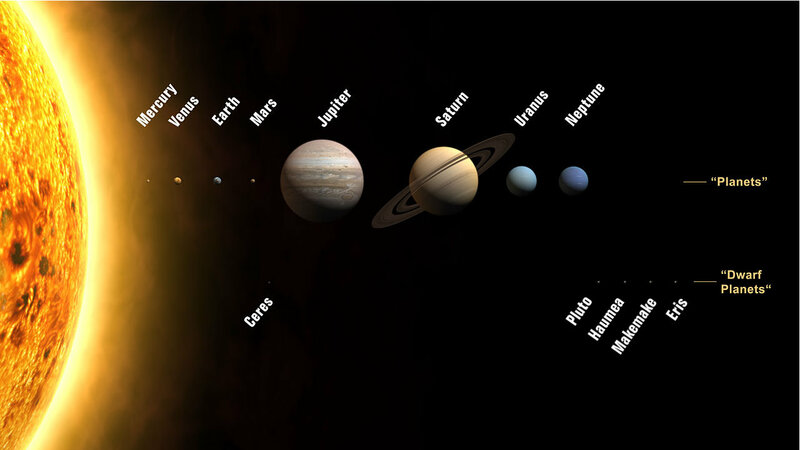 There can't be 9 planets anymore- if we call Pluto a planet, we would have to call Eris a planet also. The International Astronomical Union has officially said there are 8 planets, plus 5 "dwarf planets". The dwarf planet class includes Pluto and Eris. There will undoubtedly be more dwarf planets discovered. 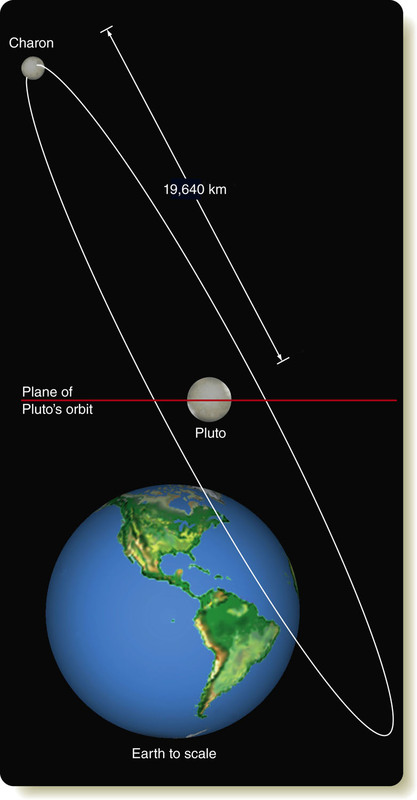 The Pluto ruckus arose partially because there is no generally accepted definition of the word "planet". Pluto the Disney dog Many people were very upset when Pluto was officially "demoted" from planethood. I am not sure why. 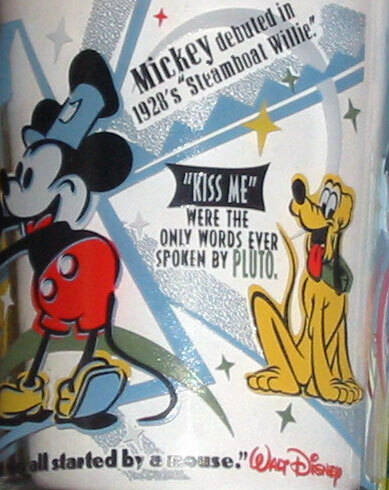 Maybe its because everyone loves Pluto the Disney dog? 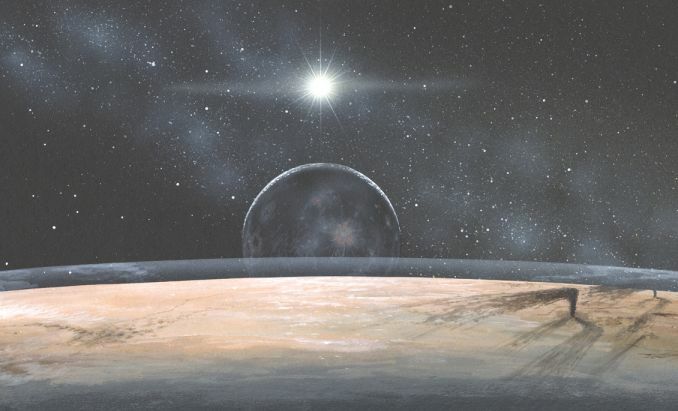 New Horizons at Pluto/Charon (artists conception) This painting shows an imaginary view of Pluto and the Sun as seen from near Charon. The New Horizons spacecraft is headed out to Pluto. It should arrive near Pluto in July 2015. It will then go on to study the Kuiper belt. Inspired, no doubt, by the Shoemaker story, an ounce of the cremated remains of Clyde Tombaugh are onboard New Horizons.